Despite his pronouncement at the State Opening of Parliament a year ago to “depoliticize” the National Telecom Commission (NATCOM), the Minister of Information and Communication, Mohamed Rahman Swarray (in photo) continues to wield political pressure over the Director General on Management issues and much to the disregard of the Board of Commissioners. Reports filtering from the Commission say that yielding to pressure from the Minister; the DG has reneged on his official decision to relocate the Finance Manager, Emmanuel Gbo-Musa to Bo following gross misconduct of the latter when he publicly insulted the DG in the presence of junior staff couple of months ago. The misbehaved Manager was officially dumped to Bo in a strong worded letter signed by the DG. Apparently licking his vomit, the DG has accepted Gbo-Musa to resume official duty at HQ on Monday 25th March 2019, and was installed in the position of the former Secretary to the Director of Admin who has been imposed to the position of Secretary attached to the Board against the wish of the Chairman and Commissioner, Dr. Prince Alex Harding. 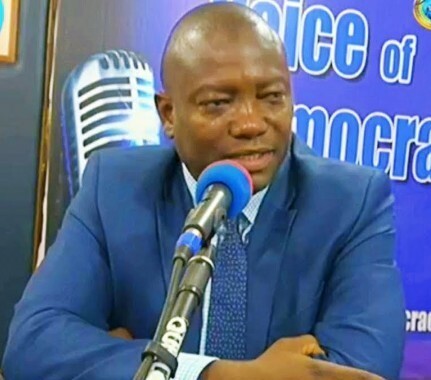 It is learnt that Gbo-Musa, who is locked in a personality conflict with the Manager of Human Resources took his wife and children to Minister Swarry’s office and laying down flat on his belly pleading for clemency. Been fickle minded and premature, the Minister picked up his phone and instructed the DG to reinstate the man who had deflated him in public. This latest development lends credence to talk making the rounds that NATCOM is recording its worst in administrative processes and procedures, describing the Commission as a “headless chicken”.